Linearly polarized light reflected from the skin has two components. The first component, which maintains the polarization of the incident light, is the regular reflectance that comes predominately from the surface of the skin. The second component undergoes multiple scattering from the various skin layers, and is therefore depolarized. Through the use of polarizing filters, one of the components can be eliminated, and consequently enhance either superficial (wrinkles, fine lines, pores) or subsurface (pigmentation, erythema, infiltrates, vessels) features of the skin. Polarized photography allows for accentuated characteristics of many dermatological conditions, including vascular lesions (such as portwine stains, rosacea and periungual telangiectasia), inflammatory lesions (such as psoriasis and acne), pigmented lesions (naevi and lentigines) and photodamaged skin [1, 2]. The pictures of the exterior part of the right hand in different configurations of the optical system are presented in table 1. An image visualizing pigmented features (3) was processed by digital filters in order to enhance melanin loss and accentuate the edges of vitiligo lesions (5). 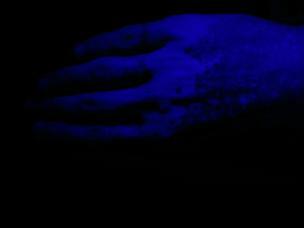 Photographs are compared with picture taken under UV light (6), which was achieved by banknote tester TOPSCAN - a substitution for the Wood's lamp. Enlarged fragments of photographs of the hand are shown below (Table 2). Table 2. 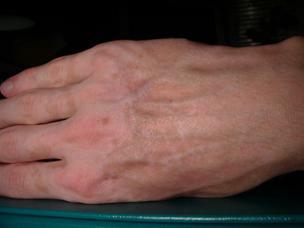 Photos of exterior part of right hand in polariscope configuration presenting: subcutaneous (left) details and superficial (right) features of the skin, with incident light angle 15°. The direction of polarisation of polarizers differs by 90°. The designed optical system for skin diagnosis in polarized light was examined for evaluation of pigment loss in vitiligo lesions. Received images depict a variety of different skin features, depending on system configuration. In the case of nonpolarized light on depigmented areas, erythema as well as epidemis structure were observed. Polarized light caused partial elimination of red areas and reduction of reflections (which are likely to be present because of fat and sweat on the skin) from epidermal cells due to linear light polarization. Pictures obtained in polariscope enhanced either superficial or subsurface features of photographed skin, depending of the angle between polarizer and analyser directions of polarization. When the polarized component of reflected light was eliminated pigmentation, erythema, vessels, and other intracutaneous structures were observed. Pictures very clearly presented hypo- and hyperpigmented lesions, which suggest possible usage of the tested device in pigment disorders to diagnosis and help control treatment. To visualize subsurface features the analyzer was turned 90 degrees (without changing the direction of polarization of incident light). Surface textures, such as wrinkles, scars, and pores were observed.